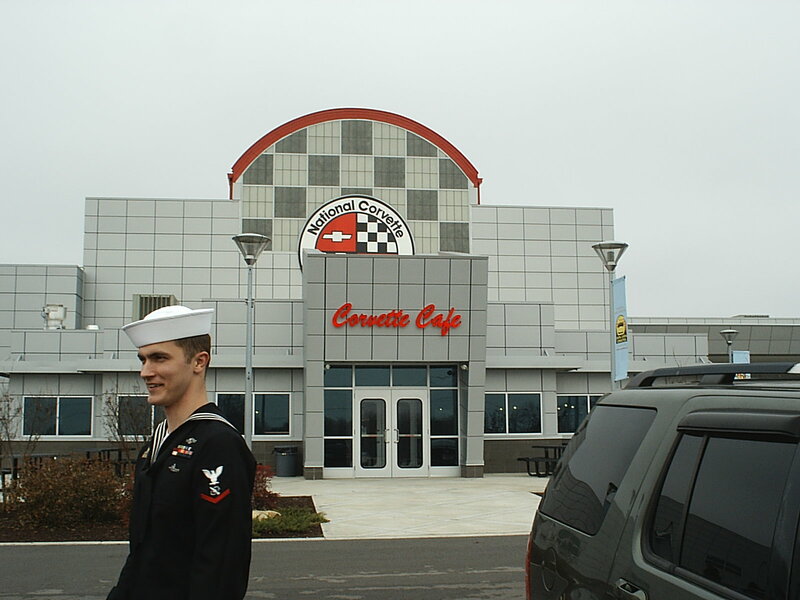 Frankfort, Ky – Senior Chief Machinist Mate (SS) Jeremy Shaw will re-enlist in the United States Navy at 3:00 PM on Wednesday, April 20, 2011. Commonwealth of Kentucky Secretary of State Elaine Walker will host the re-enlistment ceremony in the Capitol Building Rotunda, and the Adjutant General of Kentucky Maj. Gen. Edward W. Tonini will administer the oath of enlistment. The event is open to the public. LOUISVILLE, KY – Crew members from USS Kentucky (SSBN 737) and USS Louisville (SSN 724) will be conducting separate namesake visits to the Louisville-area during mid-April. In what officials describe as a rare occurrence, the sailors from both submarines will make several joint appearances at Thunder Over Louisville on Saturday, April 16. 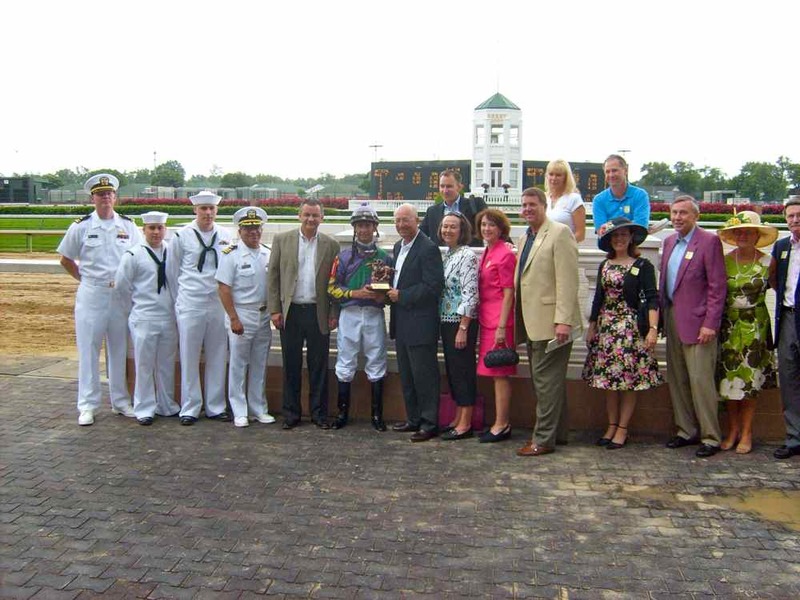 Louisville, KY – Seven sailors from USS Kentucky’s (SSBN 737) Blue Crew visited the boat’s namesake commonwealth for the Kentucky Derby 1-6 May, 2010. Commanding officer Cmdr. Eduardo Fernandez was joined by Lt.j.g. Richard L. Sanford, Lt.j.g. Hunter Barns, Senior Chief Petty Officer (SS) Thomas A. Daly, Senior Chief Petty Officer (SS) Jonathan E. Calloway, Petty Officer 1st Class (SS) Brian P. Harper, and Petty Officer 2nd Class (SS) Ricky R. Garcia for a broad-ranging visit across Kentucky. 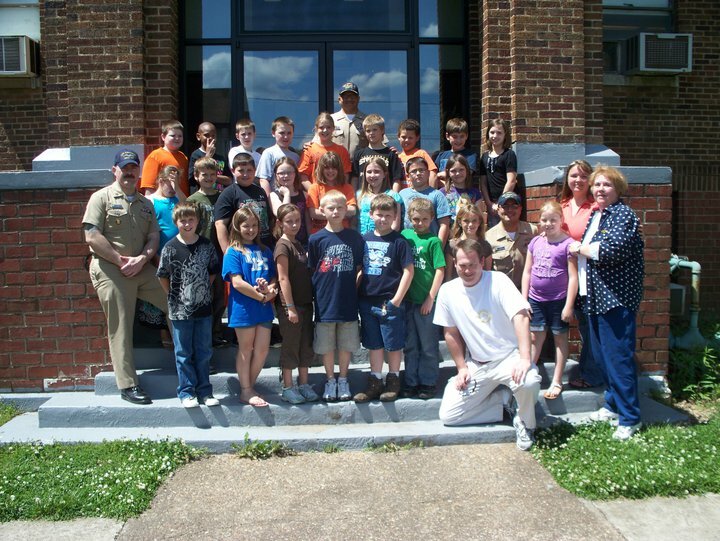 During the week, the crew members visited a number of businesses, attended the Kentucky Derby, made presentations to several NJROTC units, met with faculty and administrators at University of Kentucky, enjoyed the local hospitality, and of course made time to visit their adopted school, Worthington Elementary School. USS Louisville’s recent namesake visit is currently featured on the front of Commander Submarine Pacific Fleet’s web site. 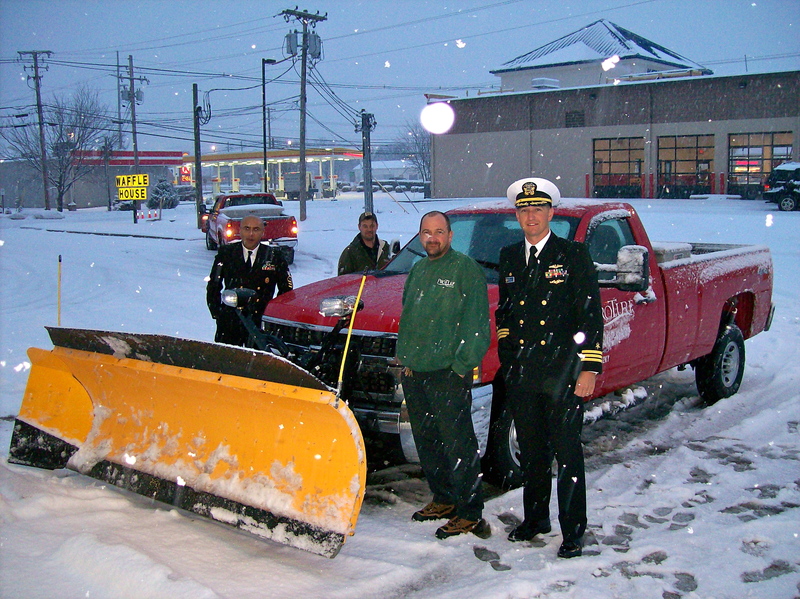 Louisville, KY - After 8 inches of snow fell on their namesake city, USS Louisville (SSN 724) Commanding Officer Cmdr. Lee Sisco and Chief of the Boat Senior Chief Yeoman (SS) Savan Patel had a chance to "tour" a snow plow. USS Louisville is homeported in Pearl Harbor. Louisville, KY – USS Louisville (SSN 724) Commanding Officer Cmdr. Lee Sisco and Chief of the Boat Senior Chief Yeoman (SS) Savan Patel visited the boat’s namesake February 7-9, 2010. Pearl Harbor - The Commanding Officer of the nuclear-powered attack submarine USS Louisville (SSN 724) Commander Lee P. Sisco is conducting a Namesake City Visit to Louisville, Kentucky from February 7 – 9, 2010. Accompanying him is his senior enlisted advisor, also called the chief of the boat, Senior Chief Yeoman (Submarines) Savan Patel. Having just taken command a month ago, the purpose of this visit is to meet with a wide variety of Louisville, Kentucky organizations, supporters, and government officials to foster the continuing relationship between the submarine and its namesake city. Bowling Green, KY - USS Kentucky (SSBN 737) Gold Crew Missile Technician 3rd Class (SS) Cameron Kisselbaugh visited the National Corvette Museum as part of a namesake visit, January 22, 2010. 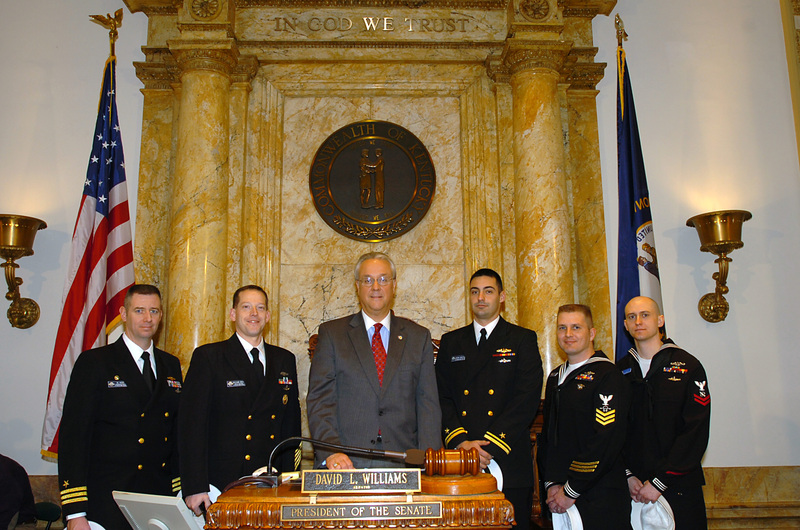 Louisville, KY – Four Sailors from USS Kentucky (SSBN 737), the “Thoroughbred of the Fleet,” conducted a namesake visit to the commonwealth January 17-23, 2010. Gold Crew Commanding Officer Ben Pearson III, was joined by Chief Hospital Corpsman (SS) Joseph C. Enderton, Machinist’s Mate 2nd Class (SS) David S. Bruner, and Missile Technician 2nd Class (SS) Cameron R. Kisselbaugh for the trip which included stops from Russell in Greenup County to Russellville in Logan County, Kisselbaugh’s hometown. 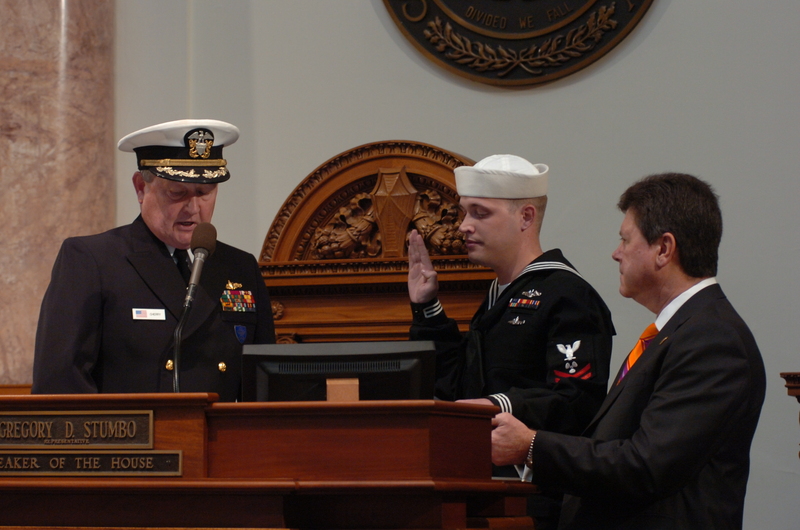 FRANKFORT, Ky. (Jan. 21, 2010) Machinist's Mate second Class David Brunner, an auxiliary man assigned to the fleet ballistic missile submarine USS Kentucky (SSBN 737) (Gold), re-enlists on the floor of the Commonwealth of Kentucky House of Representatives by Capt. (Ret.) 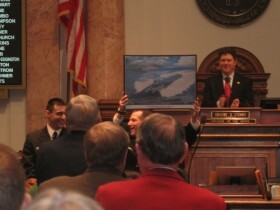 Mike Cherry with the assistance of House Speaker Gregory Stumbo. Cherry is a member of the Kentucky House of Representatives. 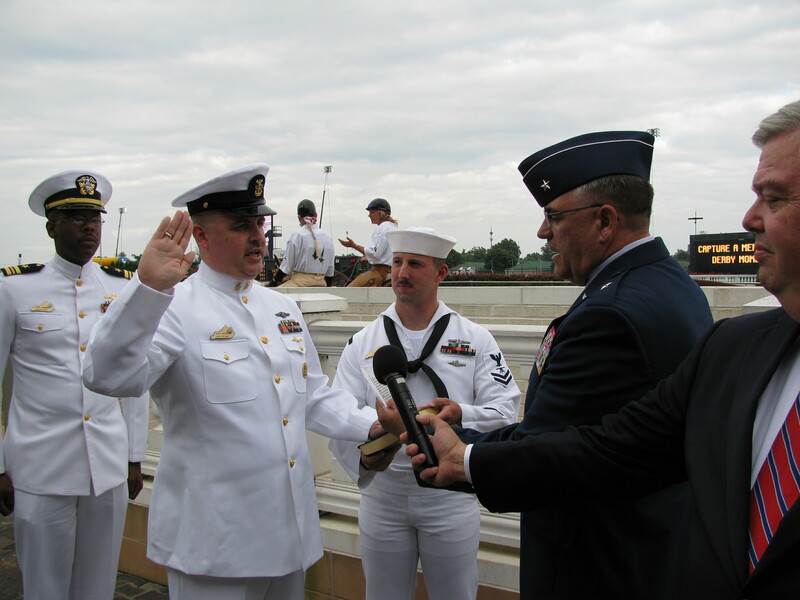 The reenlistment was the first in the history of the Kentucky Legislature. Courtesy LRC Public Information. Frankfort, KY – Machinist Mate 2nd Class (SS) David S. Brunner became the first person known to have re-enlisted during a session of the Kentucky House of Representatives today. Rep. Mike Cherry (D-Princeton), a retired Navy captain administered the oath, while House Speaker Greg Stumbo (D-Prestonsburg) held the Bible. Bruner, a native Texan, is currently assigned to USS Kentucky (SSBN 737) Gold Crew, and was in Kentucky as part of a namesake visit. 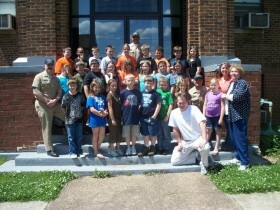 Worthington, KY – The Daily Independent in Ashland covered the USS Kentucky (SSBN 737) Gold Crew namesake visit yesterday. The article can be read on their web site. 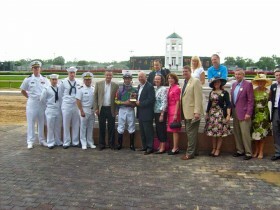 Louisville, Ky - Sailors from USS Kentucky participated in the trophy presentation to the winner of the Armed Forces Day Race, May 16, 2009. Louisville, KY – Louisville Armed Forces Committee hosts the oldest Armed Forces Day dinner in the nation on the Friday before. It has become tradition to sponsor a Day at the Races on Saturday. This year sailors from USS Kentucky’s (SSBN 737) Blue Crew found themselves en route to King’s Bay, Georgia for training over the same weekend. Cmdr. Eduardo “Ed” Fernandez, commanding officer, assistant weapons officer Lt.j.g. Derek Wood, Petty Officer 2nd Class (SS) William E. Davis, and Petty Officer 3rd Class (SS) Joel N. Sorto were able to make a one-day stop in Louisville on their way to Georgia. The News-Enterprise, a regional paper covering Elizabethtown and Hardin County, Kentucky covered the recent USS Kentucky visit. Photos courtesy Kentucky Legislative Research Commission. 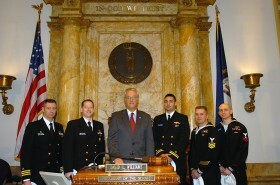 Frankfort, KY - Sailors from USS Kentucky (SSBN 737) (Blue) pose with Senate President David L. Williams (R-Burkesville) during a session of the Senate. FRANKFORT, KY--USS Kentucky (SSBN 737) Chief of the Boat ETCS(SS) William Mast holds a portrait of the ship that the crew presented to the Kentucky House of Representatives, March 5, 2009, during a visit to the Commonwealth. Just to his left is LTJG Jeremy Dawson, also from USS Kentucky. This site is not affiliated with the Department of Defense.